Antique Stools | Interior Boutiques – Antiques for sale and mid century modern furniture, french furniture, antique lighting, retro furniture and danish furniture. 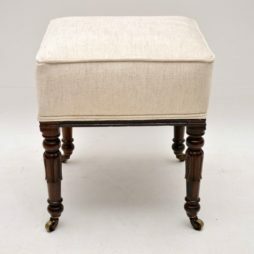 Antique William IV rosewood stool in excellent condition, dating from the 1830-37 period & having just been French polished & re-upholstered. 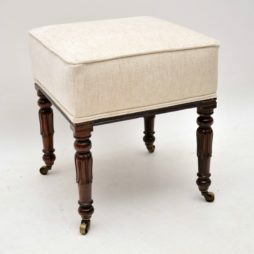 This stool has the typical William IV tulip shaped legs in solid rosewood with original brass casters. 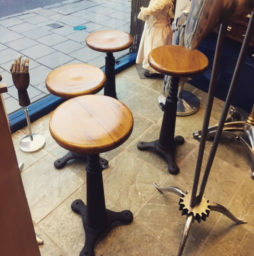 These beautiful 1920s cast iron machinists stools originally came from a clothes factory in Scotland .They are in very good condition for their age – the metal has had a good clean up, all dirt and grease has been removed, and the elm seats have been French polished. 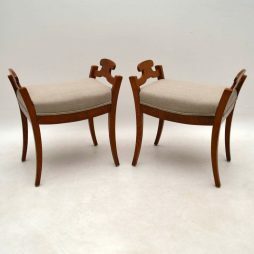 We are very lucky to have several sets and this wonderful pair is wonderful for a bistro, shop or office. 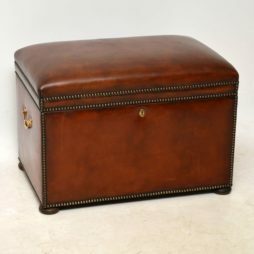 Antique William IV leather upholstered ottoman with useful storage inside. 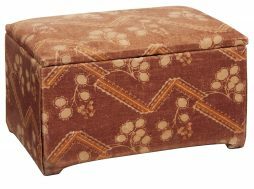 It has a padded seat, concave sides & a hinged seat that lifts up to reveal a newly upholstered interior. The leather is hand coloured showing loads of character & it’s all hand tacked onto the frame. 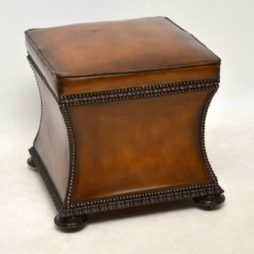 The base is carved mahogany & the feet are carved in that typical William IV design. There are also concealed casters under the feet. 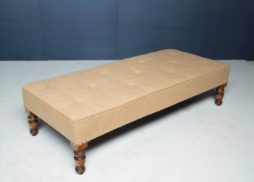 This ottoman dates to around the 1840-60’s period & is in excellent condition. 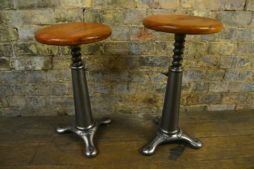 These beautiful 1920s cast iron machinists stools originally came from a clothes factory in Scotland .They are in very good condition for there age the metal has had a good clean up and all dirt and Grease hasi been removed the elm seats have been French polished.These are very rare to come across in a set of four. 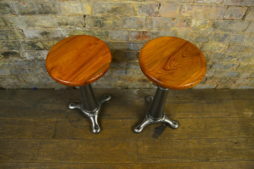 Very interesting pair of antique bar stools with leather seats & mahogany frames. 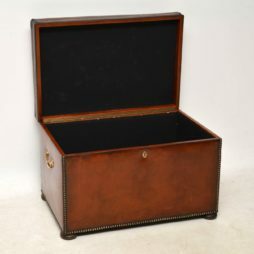 You don’t see many of these around in a classic George III style, because they all seem to be more retro these days. The leather seats are in good original condition, with a lovely colour & they are tacked around the edge. 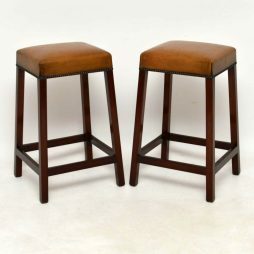 The mahogany legs are very strong & have cross stretchers to give these stools more stability & a nicer look. 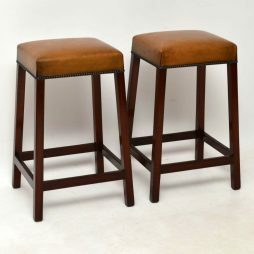 These stools do have some age & I would say they date from around the 1910-30’s period. Very stylish pair of antique Swedish Biedermeier elm stools that have just been re-polished & re-upholstered in a taupe coloured fabric. 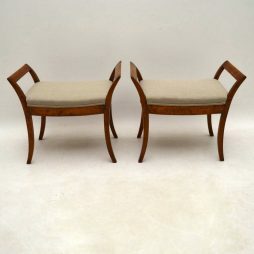 They are in great condition & date from around the 1860-80’s period. The side rails have a very interesting shape & they sit on sabre shaped legs. 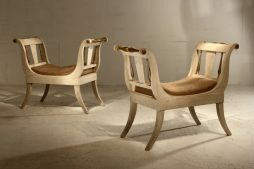 Personally, I think they would look very good at the end of a double bed, but they could have many other uses in the home. 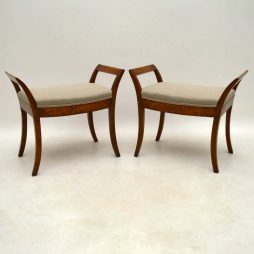 Very elegant & useful pair of antique Swedish stools in satin birch with some fine inlay. 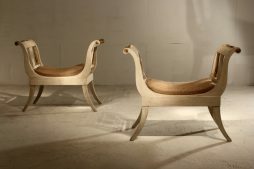 These would look great at the end of a bed. 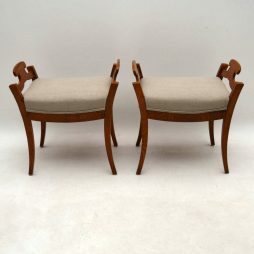 They are in excellent condition & have just been re-upholstered, I would date them to around the 1860-80’s period, although they may in fact be older. The satin birch has that lovely silky finish. 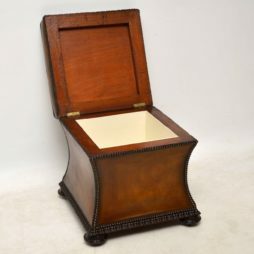 They are very much Regency in design & could be from that period. Pair of painted and gilded French stools. One being 19th Century. The other, later, possibly 1960s. 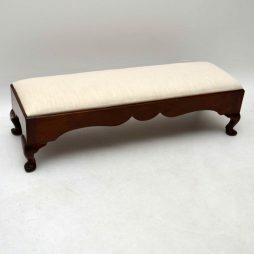 Long antique mahogany foot stool with a drop in upholstered section. 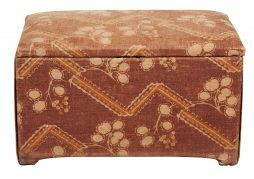 This stool has a nicely shaped frame with bold shaped feet. 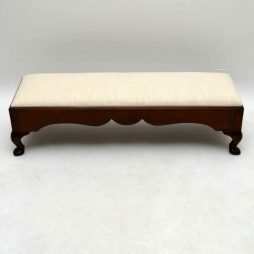 It’s in good original condition, dating from around the 1900-1910 period & has just been re-upholstered in a cream fabric.